Dr. Penelope Boston is Director of the Cave and Karst Studies Program and Associate Professor in the Earth & Environmental Sciences Dept. at New Mexico Institute of Mining & Technology, in Socorro, NM. 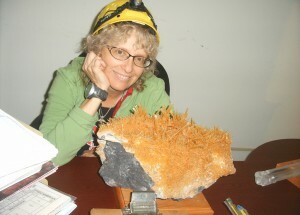 Boston is also Associate Director for Academics at the National Cave and Karst Research Institute in Carlsbad, NM. She received her PhD from the University of Colorado, Boulder, in 1985 in Microbiology and Atmospheric Chemistry. Her research areas include geomicrobiology and astrobiology in extreme environments (caves, hot and cold deserts, high latitudes and altitudes, etc. ); human life support issues in space and planetary environments; and use of robotics to assist exploration and science in extreme Earth and extraterrestrial environments. Boston is author of over 110 technical and popular publications, editor of 4 volumes, and author of two upcoming popular books. Her work has been featured in over 150 print and broadcast media outlets over the past several decades. She is a NASA Institute for Advanced Concepts Fellow and a member of the Planetary Protection Subcommittee of the NASA Advisory Council. As a student at the University of Colorado in the early 1980s, she co-founded the Case for Mars project and series of conferences. An eventual permanent human presence on Mars is one of the driving passions of her life.